Grafton was first settled in 1861, and the Great Flood of 1862 washed the town site away. The town was then resettled on higher ground in1862. Although Grafton is a ghost town, its once-thriving community spirit lives on. Its soul lives as one beholds green pastures, and imagines settlers working in the fields and crafting these buildings within this lands’ striking beauty. Grafton returns us to a time when life was tenuous but strengthened by residents who relied on religious faith and each other to survive. Such communities, then and now, instill a sense of belonging to place. This connection between people and landscape lives today through many of Grafton’s descendants. May you revel in the history of Grafton and join us in preserving its future. When settlers arrived at Grafton, the valley was like a meadow with tall grass and feed for livestock. The river bed was so narrow it could be jumped at any place with a vaulting pole. While Grafton remains the physical evidence of a time gone by, its essence lives on. The buildings and irrigated pastures take us back to a time when the certainty of life was fragile but overcome by obedience to a religion and a strong testament of faith. We can all learn from this place and recognize the power of community where a sense of place and shared culture has the ability to shape its people in concert with the land-past and present. Why did the settlers abandon Grafton? Water too much when they didn’t need it, too little when they did. 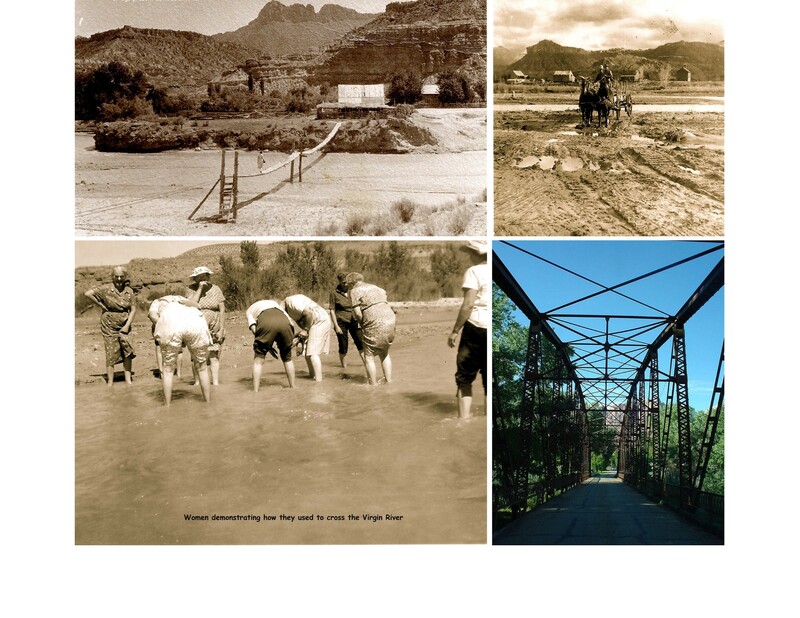 In 1906 a newly built canal delivered Virgin River water to the wide, flat Hurricane bench 20 miles downstream. Many Grafton families packed everything even some of their homes and reassembled them in Hurricane. The loss of farm fields from repeated flooding, and lack of modern utilities contributed to their leaving Grafton. Grafton’s remaining buildings stand as a place holder, a physical memory of a time and lifeway few living today recall. Towns like this are rare, and becoming rarer. 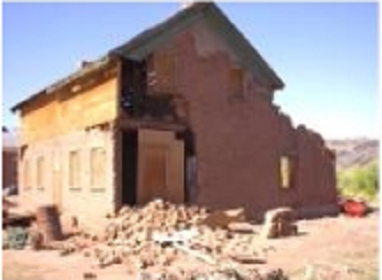 Most pioneer villages either lost their historic heart as they grew into modern towns or were washed away in flash floods. Grafton is intriguing to the traveler. Is it the area’s beauty and thoughts of past times? Is it the peaceful, quiet, breathtakingly beautiful surroundings capable of hosting a bustling community of people that lived so close to each other that community life took on a fellowship of camaraderie, mutual love, and support? Is it where survival, and colonizing success, meant people had to depend on each other? At times, the traveler may think, yes, this is the way it ought to be. Perhaps the most photographed ghost town historic structure in the Western U.S., is this rustic adobe building that stands in front of the massive tan and red walls of Zion National Park. The subject of countless movies, paintings and photographs, the building’s hand-made beauty adds a note of human gracefulness to the outstanding natural beauty that surrounds it. 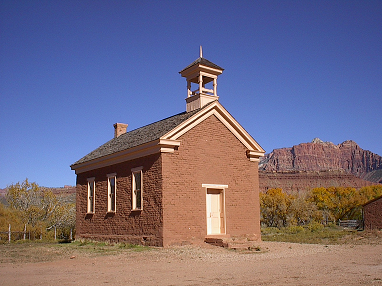 The schoolhouse’s 2-story walls stand on a solid foundation of lava rocks quarried from the nearby hillside; its colored adobe bricks were hand-made from a pit of clay on the west end of town. 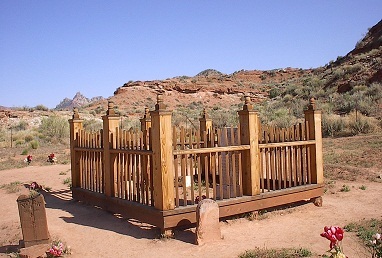 The settlers cut trees for this structure from Mount Trumbull, nearly 75 miles away, and bought them across the Arizona Strip and down the steep canyon cliffs of the wood road near the cemetery. 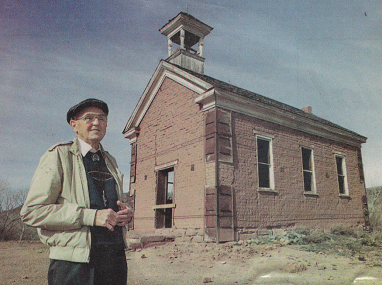 The town’s people used this building as a school, community meeting place, church as well as a place for dances and plays. 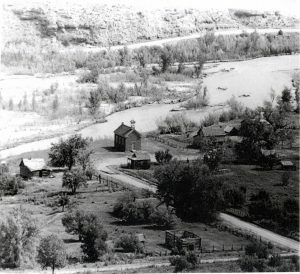 People would come from all the settlements on the Upper Virgin River to attend the community dances, which were held on weekends. As was customary with dances in the early west, they continued early into the morning, sometimes until dawn. Then people would hitch up their wagons, buggies or horses and head back to their homes for Saturday chores and Sunday preparations. The last classes were taught in this building during the 1918-19 school year at which time the enrollment had dwindled to nine students. The following year students were transferred to the school at Rockville. Alonzo Haventon Russell came to Grafton in December 1861 with his wife Nancy Briggs Foster and their children. He may have built the home that remains standing in Grafton at the same time the school was built in 1886. The adobe home has a beautiful restored hand-crafted front porch where Alonzo’s family often met to socialize, sing, and listen to the music of his guitar. Alonzo Russell had his own family band called the Russell Band in which he played drums and fifer. His sons played fiddles, accordions, guitars, and mandolins. Alonzo was an expert blacksmith by trade and supplied the town with eating utensils and farm tools in addition to repairing broken wagon parts, sharpening plows, and shoeing horses. Because Indians would try to steal their cattle, Alonzo made hobbles for the cattle the Indians couldn’t undo. Alonzo had four spouses. His first wife, Fanny Malina Royce died in childbirth in 1845. He then married Nancy Briggs Foster. Alonzo made a loom for Nancy and they carried it across the plains. Later it was given to the museum at Pipe Springs National Monument, and a replica can be viewed there today. Alonzo and Nancy had nine children; the last four died as infants. In 1853 Alonzo married Clarissa Henrietta Hardy as a plural wife. She gave birth to three children before their divorce. One of the children died as an infant, and Alonzo and his second wife Nancy raised the other two. In 1856 Alonzo married Nancy’s sister, Louisa Maria Foster. Louisa gave birth to nine children. 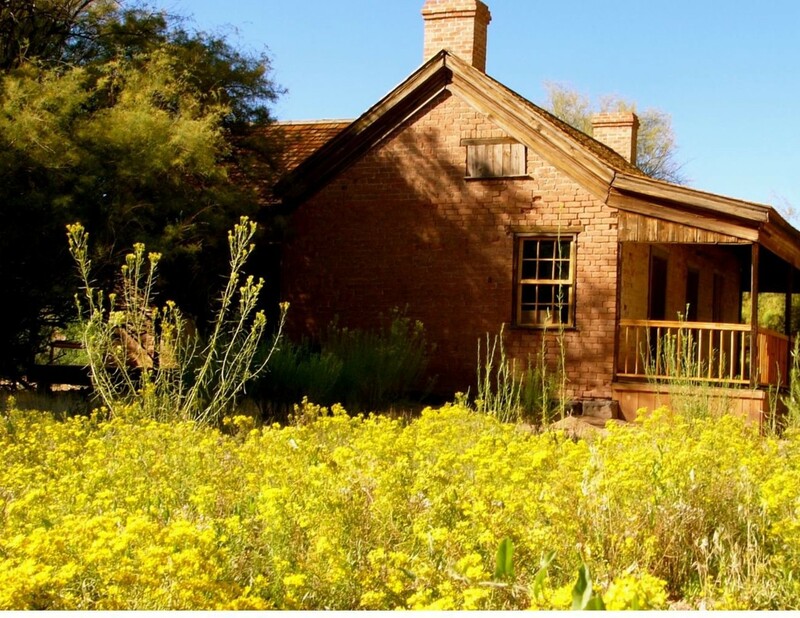 Nancy lived in the large adobe home and Louisa lived across the street in the small log cabin that has been restored. 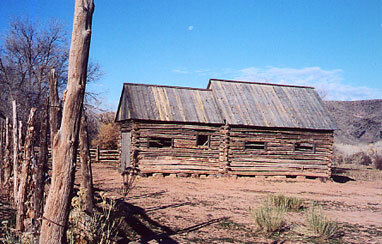 Alonzo lived in the adobe home until he died in 1910 at the age of 89; he is buried in the Grafton Cemetery. Louisa Maria Foster and Nancy Briggs Foster are also buried in Grafton Cemetery. Alonzo’s son Frank Stephen Russell bought the house for $200 and a cow. Frank and Mary Ellen Ballard Russell moved into the house in 1917 and lived there until they moved to St. George in 1944. They were some of the last residents to leave Grafton. John and Ellen Smith Wood and their children lived in Grafton. John was a farmer, raised cattle, worked in a blacksmith shop, and made beautiful horse-hair ropes and hackamores in his spare time. An historic split-rail fence surrounds the property. Ellen died on May 7, 1898, and is buried in Grafton cemetery. John lived in Grafton until 1909, then moved to Hurricane, where he died August 4, 1911 at the age of 92. The property contains two other buildings: a large log barn (1877) and a raised one-room log granary (1877). David and Maria Smith Ballard built a home and barn around 1907 in Grafton and the buildings still stand. David was born at Grafton in 1867 to John Harvey Ballard and Charlotte Pincock. David died in 1939 at the age of 72 and is buried in Rockville. Maria was born in Rockville in 1867 and died in Cedar City in 1917 at the age of 50. Her father was Charles N. Smith. Like most other Grafton residents, David worked as a cattle rancher. Cattle ranching became Grafton’s principal industry decades earlier due to the difficulty and unpredictability of growing crops. He is Jeff Ballard’s grandfather. David’s father, John Harvey Ballard, first settled Grafton in 1862. He was a farmer, stock raiser, postmaster, and shoe mender. He was also an excellent violinist and provided music for local communities. He served as a chorister for many years. John and Charlotte had 14 children: 11 sons and three daughters. Only five boys lived to adulthood. John and Charlotte and five of their children are buried in Grafton Cemetery. Alonzo and his first wife Nancy returned to Grafton in 1868 after the Indian Troubles; however, his third wife Louisa remained in Rockville, giving birth to three more children while there. Between 1873 and 1879 Alonzo built this one story, gabled log home for Louisa Maria. In 1879 she returned to Grafton, and their six children were raised in this home. In 1861, Sarah and William Hasting and their three children settled in Grafton. They lived in a wagon box, cooked over a campfire and lived on caneseed bread, pigweed and sego lily roots. William bought a dugout from the Romney family (Hastings Dugout). It is now just a depression in ground behind the cabin pictured above. The lot is located on a corner across the street from the schoolhouse. The dugout was a room 12 by 14 feet, which was a hole dug in the ground and hill and walled up in front with two windows and a door. William died in 1882 at the age 58. Sarah lived there for over 50 years and moved from Grafton to Hurricane in 1915. She died in 1920 at the age of 90. 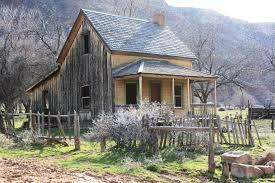 In 1947 a log cabin was moved from Beaver, Utah to the Hastings Dugout lot in Grafton for the movie Ramrod. The cabin interior had plaster walls and used extensively in the movie as Rose’s home and dressmaker shop. My father always called it the Ruby cabin so I will call it the Rudy Rose cabin. My father, Jack Harden fell in love with Grafton. He was born in Salt Lake City and we would drive back and forth from Los Angeles stopping at Grafton. We either forged the Virgin River barefoot, or walked across a board and cable footbridge, or drove across the steel bridge. But we had to open and close many gates all along the dirt road to Grafton. The Berry headstone found within the wood fenced enclosure near the center of the cemetery reminds us of a time when there wasnï¿½t enough to go around. When the Utah Territory was settled, the upper Virgin River was already inhabited by native Southern Paiute peoples. Pioneers often settled the same places required by these native people for their subsistence. This competition for land and scarce resources led to conflict. 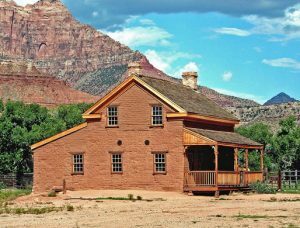 At the same time, Navajo people living south of the Colorado River were squeezed between pioneer settlement in Arizona to the south and Utah to the north. 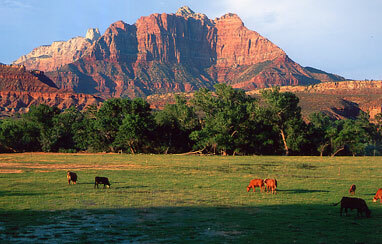 In December 1865, Navajo raiders stole cattle and horses from Kanab and the Shirts ranch at Paria. 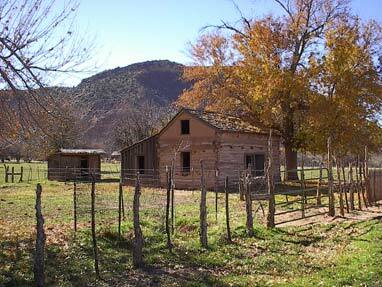 InJanuary 1866, two ranchers were killed at Pipe Spring and their cattle stolen. Consequently, the Mormon militia killed Indians near Pipe Springs and in retaliation the Indians killed the Berrys, who were traveling home to Berryville (now Glendale on Highway 89), near Colorado City. 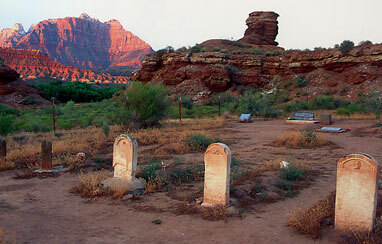 At the time, Grafton was the County Seat, and their bodies were brought to Grafton for burial.During this time, Mormon Church leader Brigham Young ordered villages in southern Utah to coalesce into towns of at least 150 men. Grafton and other Virgin River towns were deserted as townsfolk consolidated in Rockville. Grafton farmers returned daily to tend their fields, and by 1868, Grafton was resettled and the residents were back, working to create the future. Mary Lavina Andrus died at one year of age; Mary Jane York, 28, died of tuberculosis, Byron Lee Bybee, 65, died of ï¿½poor health.ï¿½ And there were accidents: Joseph C. Field, 9, was dragged to death by a horse. Robert Madison Berry, 24, his wife Mary Isabella Hales Berry, 20, and brother Joseph Smith Berry, 22, were killed by Navajo raiders. Today, the cemetery is an historical monument that provides a unique opportunity for area visitors to learn about early pioneer settlement and Grafton’s human history. It serves as a cultural legacy to the many families who are descendents of Grafton settlers. The cemetery is included as a contributing feature to the proposed “Grafton Historic District”. The Grafton Heritage Partnership (Partnership) entered into a cooperative management agreement with the Bureau of Land Management so that the Partnership can manage the site. 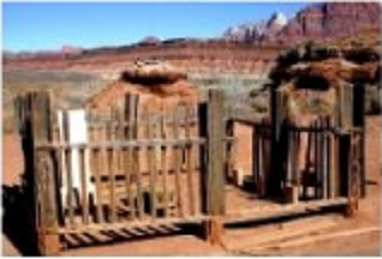 The agreement would allow the Partnership to improve existing site conditions by replacing the existing fence surrounding the cemetery with like-kind materials, repair the wood headstone enclosure, install interpretive signage that includes pioneer and Southern Paiute history. Agriculture-the most useful, the most healthful, the most noble employment of man. I know of no pursuit in which more important service can be rendered to any country by improving its agriculture. Agriculture played an important part of Grafton’s history. The settlers had to live off the land to survive. They built dams across the river and diverted water for cotton and other staple crops. They planted orchards and by 1855 the fruits were used fresh, dried and as preserves. A variety of nut trees were planted making pecans, black walnuts and almonds available. Some of these fruit and nut trees are still alive and producing. As the years progressed, raising of cattle and other animals became an increasingly important occupation for the early settlers. Nearly every family had at least a few head. Shortly after 1865 they started to change from farming to cattle raising. The harvest in 1866 was from 21 acres of wheat, 45 acres of corn, 18 acres of cotton and 8 acres of sugar cane. By about 1874, silk production had become common in Grafton. However, as with cotton, silk production lasted only a few years. The settlers were more concerned with growing food crops and were often too busy recovering from floods to concentrate on silk and cotton production. The Partnership is working with the other landowners in Grafton in order to conserve this agricultural, scenic and historical heritage. This foot bridge, known as the Swinging Bridge shown above, was one of the ways to cross the river in early days another was by horse team or by wading, as demonstrated by these women at the first Grafton reunion in 1961. In 1924 the Historic Rockville Bridge was constructed that provided another way to get to Grafton. A visit to Grafton wouldn’t be complete without a visit to the Virgin River that forms the Townsite’s northern boundary. Pioneers raised garden crops on the few acres of sandy river-deposited soil next to Grafton. Today, these soils support an impressive gallery of trees, plant and wildlife species, including one of only a handful of remaining stands of cottonwood trees anywhere along the Virgin River. The Partnership is interested in helping manage the floodplain for native plant communities. This will include removing the exotic tamarisk and Russian olive trees and restoring the natural cottonwood, willow, and grass communities. A restored floodplain with native plants presents an opportunity to interpret Grafton’s natural history, especially as it relates to the town’s human history. It was the river that both gave life to and drove away Grafton’s residents.